FORMER chief magistrate John Numapo has been appointed as the new Chief Magistrate of the Solomon Islands. He was sworn in yesterday in the capital Honiara by the Chief Justice of the Solomon Islands Sir Albert Palmer. Mr Numapo is not new in the judiciary sector in Papua New Guinea’s closest Melanesian neighbour, having worked in several adviser and consultant roles, the last one was in 2013- 2015 as judicial administration adviser under the Solomon Islands justice programme funded by Australia. He was based primarily at the magistrates’ court during that period and is well versed and familiar with the needs and challenges of the magistracy and judiciary in the country. The chief justice described this as "a very significant step in enabling the country’s judiciary to be able to improve the terms and conditions of magistrates and to be able to successfully recruit magistrates to fill up long outstanding vacancies". "An immediate positive spin-off from this was in having one of our priorities met in having resident magistrates stationed in the five districts centres," Sir Albert said. The Solomon Islands has a population of about 600,000 compared with PNG which has 22 provinces and 89 districts and magistrates are based or locally resident in all 22 provinces and 35 Districts. In contrast, Solomon Islands has nine provinces and five districts centres to have resident magistrate, only Auki, Gizo and Kirakira apart from Honiara, have resident magistrates on site. The PNG Magistracy has a total of about 113 Magistrates and 527 support staff. Justice Palmer said that he made the comparison so that everybody could understand that the problems and challenges that were faced in the judiciary in Solomon Islands, especially in the Magistracy, are magnified many times over in PNG and so there is much to be gained from their experience in addressing similar challenges but in a much smaller scale in the Solomon Islands. Mr Numapo was in the forefront in the Magistracy in PNG when the move to self-autonomy and self-administration for the Magistracy was achieved. 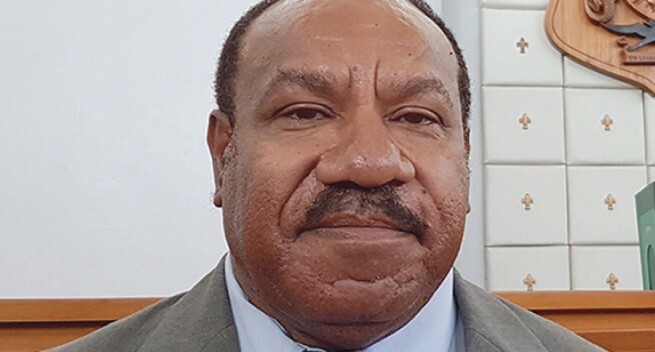 "His knowledge, understanding and experience to that extent in achieving that milestone for the PNG Magistracy would also be invaluable as we seek to traverse the same path ourselves," Justice Palmer said. Justice Palmer said; "In terms of qualification, knowledge, skills and experience we are privileged to have his services for a limited window of time, to assist us in getting things up and going in the right direction in the Magistracy." Mr Numapo has a diploma in Law in Court Administration and Magisterial Duties UNPNG, LLB with Honours from the UNPNG and Master of Laws from the University of Melbourne, Australia. "He has vast experience in the Magistrates’ Court in Papua New Guinea, 24 years in total, starting off as a district Court Magistrate, a post which he held for 12 years from 1986-1998, Deputy Court Magistrate for 3 years, from 1999-2001 and from 2001-2009, a period of 8 years, 2 years as Acting Chief Magistrate and 6 years Chief Magistrate. "Therefore, he joins the judiciary in the country with a solid background of relevant magisterial experience," Justice Palmer added. Meanwhile, the new chief magistrate said that he has some level of confidence to undertake the position as he has been there and is aware of the challenges the magistrates court in the country is facing.